The general relationship then becomes the starting point for exploring the more complex variations. It can be intuitively expected that larger animals have larger home ranges. Based on a study of small mammals, Brian McNab suggested in 1963 that home range scales with body weight in a manner similar to that of basal metabolic rate (BMR) and body weight (M. Kleiber had earlier demonstrated BMR to scale as W 0.75 ). He thus concluded that home range size in mammals is determined by their rate of metabolism or energetic needs. An exponent greater than about 0.75 indicates that home range size increases with body size more rapidly than does metabolic rate with body size. One explanation for this is that the mean abundance of resources within the home range decreases with larger area as these include blanks or patches of low productivity. J. Damuth has argued that the home range area of larger animals is shared with more individuals of the same species (i.e., greater range overlap); hence, there is the need to cover even larger areas to obtain the necessary resources. Home range areas may thus have to be transformed to an individual basis before making comparisons across species. Michael Reiss provides a concise review of several of these ideas in a 1988 article. What do some of these theoretical relationships imply for elephant home ranges? One interesting observation is that the predicted home range of an adult female elephant (say, 3,000 kg in weight) as computed from the range of exponents and associated functions in the literature goes from the smallest recorded area (about 10 km when using the Kleiber/McNab value of 0.75) to the largest area (about 10,000 km2 when employing the Swihart value of 1.56). As the majority of elephant populations studied have intermediate-size home ranges, a function such as that derived by Owen-Smith using an exponent of about 1.25 seems to be the most appropriate. We still have to seek explanations for the wide variation in elephant home range sizes both across and within populations. One obvious pattern that emerges when home range sizes across elephant populations are considered is a negative relationship between rainfall and range size (fig. 4.17). As the annual rainfall increases, the home range area of female elephants decreases. Actually, this is not a simple linear relationship, but one that scales linearly as the logarithm of home range versus rainfall. In comparisons of this kind, there are numerous problems. Is total annual rainfall an adequate measure of environmental moisture, or is the seasonal distribution of rainfall more appropriate? 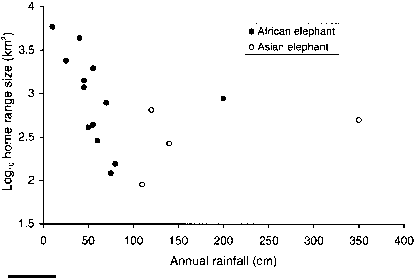 How does one derive a figure for rainfall when this itself varies widely across the home range of an elephant group? The elephants themselves may be tracking spatial variation in rainfall over the year. The variability in home range size within a population also has to be considered. Does an average figure adequately represent home range size for a population? We are only just beginning to get information on home range sizes for elephants in the high rainfall regions of the two continents. The relationship between annual rainfall and home range size in several African and Asian elephant populations (see text). Home range sizes clearly decline with increasing rainfall in the low-to-medium rainfall habitats of African elephants. simplest explanation for this is that overall productivity decreases and patchi-ness of nutritional forage (and water) increases with declining rainfall; hence, there is an increase in elephant home ranges. While this may be true for habitats from low-rainfall desert through semiarid savannas and woodlands to deciduous forests with medium rainfall (about 1,000-1,300 mm/year), it is not clear that productivity is indeed higher from an elephant's perspective in the high-rainfall (>2,000 mm/year) areas. In tropical rain forest, for instance, the density and quality of plants palatable to elephants is low even though overall vegetation productivity is high (see chapters 5 and 6). One would then expect a reverse trend in home range size, that is, an increase in tropical moist forest. Unfortunately, our knowledge of elephant movement in tropical rain forests is extremely scant, but we have indications that range size does increase in the moist forests. Several of the telemetry studies have shown shrinking of home range size during the dry season with expansion during the wet season or during winter. When water or green biomass is scarce, elephants would naturally be confined to small areas where these resources are available. They could also quickly move from one resource patch to another. Many observers have also noted that female groups are conservative or show fidelity to their home range, at least in the short term of several years. Elephant movement is usually an annual round-trip within this range. This means that an elephant group moving over even long distances comes back to a given locality during a particular season or month (these movements are sometimes precise to the nearest week!). Elephants seem to track changes in the phenology of vegetation and water availability within their home range and move accordingly. It is not improbable that other tracking mechanisms also operate in elephant movement. I have already mentioned the ability to detect moisture or infrasound from thunderstorms, but it is now well known that animals have navigational abilities based on both terrestrial and celestial cues. We can expect an intelligent, well-traveled animal like the elephant to retain in its memory a detailed "cognitive map" of its home range. Several "experiments" in which elephants, usually problem animals, have been translocated have failed, with the animal returning to its place of capture, sometimes traversing over 200 km through presumably unfamiliar terrain. This certainly suggests a navigational ability that goes beyond a cognitive map of its familiar range. The evidence so far suggests that, within a population, the home ranges of family groups overlap to varying degrees. However, there may be differences in the time of year when unrelated family groups utilize a particular area of overlap. The observation that several family groups, which associate with each other, also show coordinated movements within a defined home range over the year takes us to the issue of what constitutes such groups. This is still only a partly answered question in elephant social organization, an aspect I deal with below. 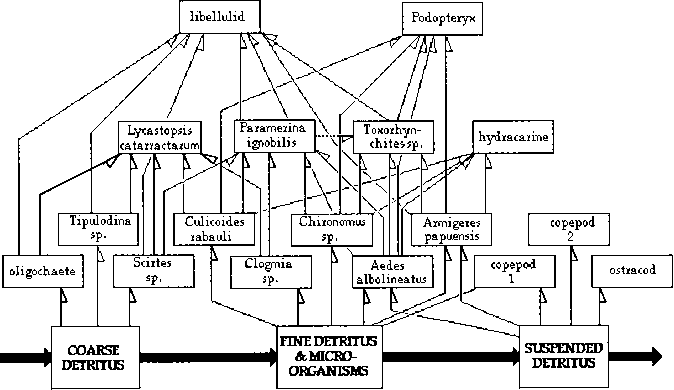 Depending on the size of such groups, the terms bond/kin groups, clans, and subpopulations have been used from the smaller to the larger groupings. The important question is whether, at the population level, the home ranges of elephants are simply a series of overlapping ranges of individual or a few family groups or whether there exist higher levels of social groupings, each with its unique home range. The association, movement, and spacing of family groups may vary according to population densities, climate, habitat type, and resource distribution. How can we explain the almost 50-fold variation in home range areas of family groups within a single population observed by Chris Thouless in northern Kenya? At a proximal level, the spatial variation in rainfall can explain some of this variation in home range size. The rainfall, however, varies only twofold across this population, a difference that is common across the range of many other elephant habitats without the accompanying magnitude in variation of home range sizes. One explanation provided by Thouless is that the movements of some of these elephants (or subpopulations) are of recent origin because of disturbances from land-use change and hunting. Elephants having small home ranges within ranches moved to these locations in recent years. Presumably, these ranges could further change in the future. The short- and the longer-term historical elements in the evolution of elephant home range sizes and spacing of social groups must thus be considered. Even when home range areas of social groups overlap extensively, the temporal partitioning of habitat use suggests avoidance behavior to reduce competition. Home range areas and access to resources within may depend on dominance ranks of matriarchs leading the social groups, an aspect that we are only beginning to understand. Finally, we must briefly consider how adult male elephant ranges are organized with respect to one another and in relation to female group home ranges. Male home ranges also overlap considerably. The majority of the relatively fewer studies also indicate that adult males have smaller home ranges or smaller core areas than do female groups in the same population. There are, however, some populations, such as Kruger, in which the males clearly have a significantly larger range than do the female groups. The home range of a male also increases substantially when it comes into musth as it searches for estrous females. Bulls may also utilize exclusive habitats (the so-called bull areas) such as steep hill slopes or those considered too marginal or poor in resources for use by female groups. The more intensive use of agricultural areas by bulls also introduces a difference in their movement patterns and home range attributes. Spatial segregation of the sexes on a seasonal basis has been well documented in several ungulates. One explanation is that, during the nonbreeding season, the males may use certain areas to recuperate their energies in addition to enacting social roles among themselves. It is important to study male home range over several years or decades beginning with the male's dispersal. Many observers report the sighting of adult bulls not seen earlier over years of watching elephants at particular localities. It is possible that adult bulls may shift their range during their lifetime as opposed to the more conservative behavior of family groups. Of course, all this must remain partly speculative until the "lifetime track" of elephants is studied.